I cannot remember where I saw the recommendation for Le Mesturet in Paris, but as it was only a 20 minute walk from where we were staying, it seemed like the perfect place to go for dinner. The restuarant is in the 2nd arrondissement, with easy access to the Metro. Having returned from the Burgundy region, we chose a carafe of Bourgogne Pinot Noir Bader Mimer to drink. The wine was slightly acidic, with a distinct nose of red berries. We did not have starters as we had had a late lunch and I chose the fresh cod with home made aioli for my dinner. Despite it being served on a cold plate, the meal was perfect with just the right level of garlic. My cod was served with periwinkles, which I teased out of their shells with a fork. A hat pin would have been a good idea. Dave chose the fricassee of Beliac lamb which was served with an olive, tomato and lemon compote. The lamb was tender and moist and flavoursome. Both of the plates came with streamed seasonal vegetables. We decided to have dessert at a local ice cream place, so our visit was short and sweet. The coffee is good and you will find the staff most helpful and able to speak English fairly well. Le Mesturet is situated at 77 Rue de Richeliue in Paris and is open 7 days a week from 12h00 to 23h00. Prices are reasonable and the restaurant is worth a visit. Contact them on +33 142 974068 and I would recommend that you make a reservation as they were pretty full on the Sunday evening when we went. The cod dish looks good. Toothpicks are practical for teasing out mollusks, too! Thanks for sharing, Tandy! I should have thought of toothpicks! I’m so jealous of all these awesome meals you’ve been enjoying lately!! I am enjoying your French holiday stories – thanks Tandy. Did you read my blog about our trip? 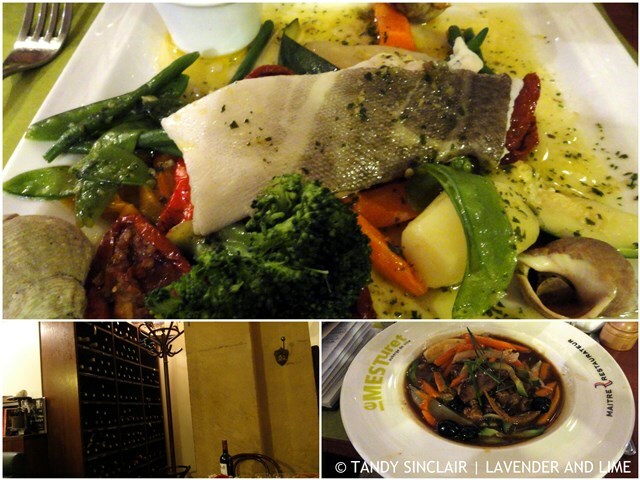 We went to Le Mesturet a few years ago and really loved our meal! We had the tête de veau or calve’s head. So delicious!